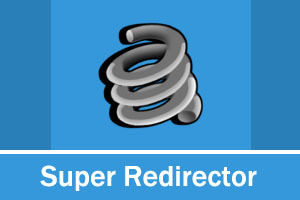 This is one versatile Redirector, it can redirect according to roles, user, URL referrrer, IP, country, mobile, url and so on. With this module, you can flexibly and conveniently control website visitors where to go. Support swithing between mobile site and full site. If you want site to keep displaying full site, you can add parameter mobile=false in the URL. Compatible with DNN 5.x, DNN 6.x, DNN 7.x, DNN 8.x, DNN 9.x. Added the feature of importing and exporting Rules. 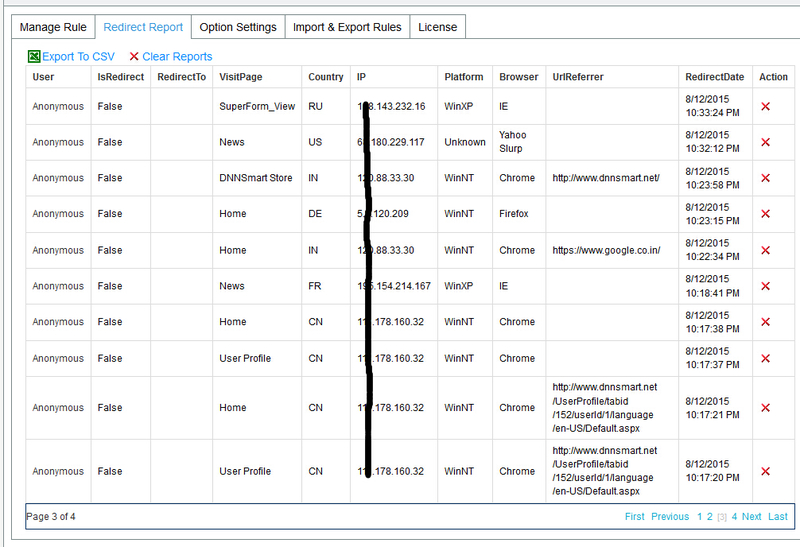 Added Redirect Report function, module could record Display Name, Redirect Target, Visit Page, Country, IP, Platform, Browser, Url Referrer, User Agent, RedirectDate of the page which users visited. 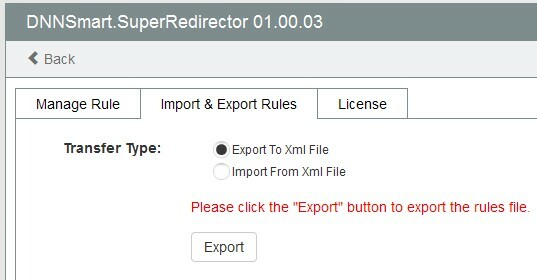 Added "Export Redirect Report To CSV" feature, you can export redirect report and then use Excel software to view report. Added "Report Expired Days" option, admin can configure to record report of how many days. Expired report will be deleted automatically. Added "Countdown redirect" feature. After enabling this feature, users won't directly redirect when they meet the condition. They will see one countdown, they will only redirect after countdown is over. You can configure time of the countdown. In default, it's five seconds. You can configure template of countdown. You can modify the content that users will see in the front-end, you can also change location of [Countdown] token. On Edit Rule page, we added option "Redirect Or Not". In default, it will be true. After you uncheck this option, it will own the highest priority. As long as it meets this piece of rule, users won't redirect. 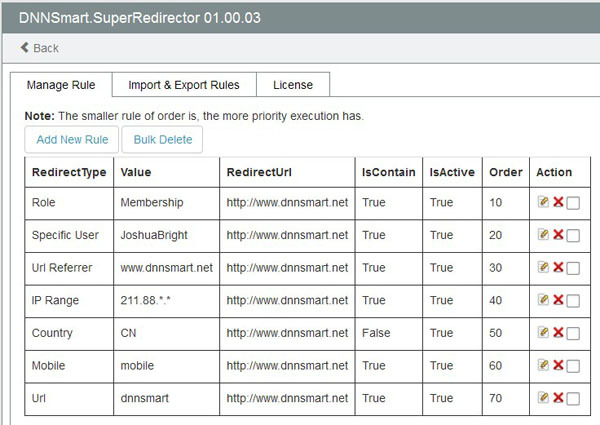 On "Manage Rule" page, we added bulk delete feature. We also added "Check All" and "Uncheck All" button. On "Manage Rule" page, we added the feature of draging rule item to sort. 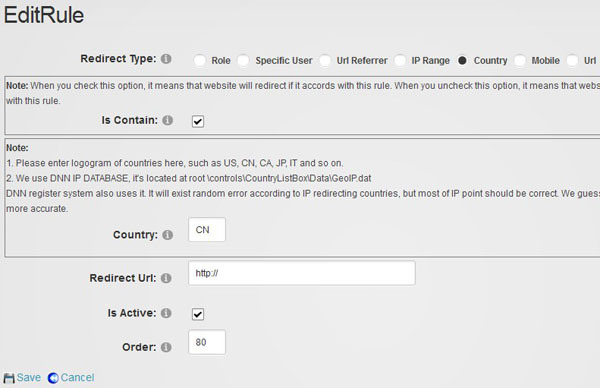 Added option "Redirect Only First Time". When checking this option, redirect will only occur when users visit the site for the first time. Add the "Report Save Count" option, you can set how many records are saved only, and the excess will be cleared. Configure it to be 0, this means that it won't automatically delete report forever. If leaving blank in RedirectUrl field, module can't work correctly. In this version, we fixed this issue already. Made the module be compatible with DNN9. We applied one kind of api which will recognize countries according to IP, this improves the accuracy of recognizing countries.